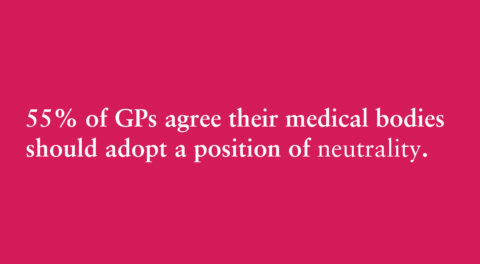 - Poll shows 55% of GPs agree their medical bodies should adopt a position of neutrality. - Doctors evenly split on whether they support or oppose a change in the law, but 43% would want the choice for themselves if they were terminally ill and suffering. A poll of more than 1000 GPs has found that most doctors would want their medical bodies to be neutral on the subject of assisted dying. This comes as the Royal College of Physicians is shortly to survey its own membership as to whether the College should adopt a position of neutrality. A survey from the Royal College of General Practitioners (RCGP) is also expected later in 2019. The poll, conducted by research company medeConnect in January, found that 55% of respondents either agreed or strongly agreed that medical bodies like the RCGP and British Medical Association should “adopt a position of neutrality on the issue of assisted dying for terminally ill, competent adults”. Only a third of doctors disagreed. The same poll found that GPs were personally split as to whether the law should change. 33% opposed a change in the law on assisted dying, while 32% supported it. 34% were neutral or did not know whether assisted dying should be legalised. Asked whether doctors would want the choice for themselves, 43% said, if they were terminally ill and suffering unbearably at the end of life with only months or weeks to live, they would want the option of assisted dying. Only 27% said they would not want the choice, while 29% did not know or declined to answer. “These results show what we know to be true, that there’s no consensus amongst doctors when it comes to the subject of assisted dying. Because of that, most doctors think their medical colleges and representative bodies should adopt a neutral stance so that everyone’s views can be represented. Polls of the general public have consistently found that an overwhelming majority would support a change in the law to allow terminally ill people choice and control over their death. medeConnect conducted a survey of 1,005 UK GPs between 14th-31st January 2019. Quotas were used to ensure the sample was representative of the nations and regions of the UK. Dignity in Dying is the largest organisation campaigning for a change in the law on assisted dying for terminally ill, mentally competent adults. It campaigns for assisted dying to be legalised in the UK based on the laws that have operated in the USA, beginning in Oregon in 1997 and have been copied in California, Colorado, Hawaii, Vermont, Washington State and Washington, DC. In 2014, the Royal College of Physicians surveyed its members and found no majority for any position. While a plurality (44%) of its members believed the College should be opposed, a majority believed the College should either be in favour (25%) or neutral (31%). In 2013 the RCGP also consulted its members in a mixed approach. Only 234 members responded directly to the consultation while a larger number responded through local faculties in a variety of methods. Of those 234, 77% believed the RCGP should remain opposed to assisted dying. Canada legislated to allow assisted dying for terminally and chronically ill adults nationwide in June 2016. Victoria State in Australia legalised assisted dying in November 2017 and will begin to offer assisted dying to its citizens later this year. It, too, is based very closely on the Oregon legislation.